Cheesecake is one of those diverse desserts that is classic, yet fancy, while its recipes are easy enough for a beginner to make. 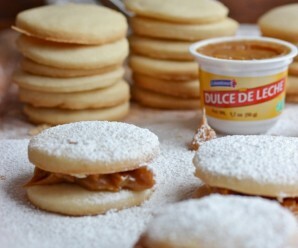 I already have a great recipe for dulce de leche cheesecake and wanted to create something a little different. 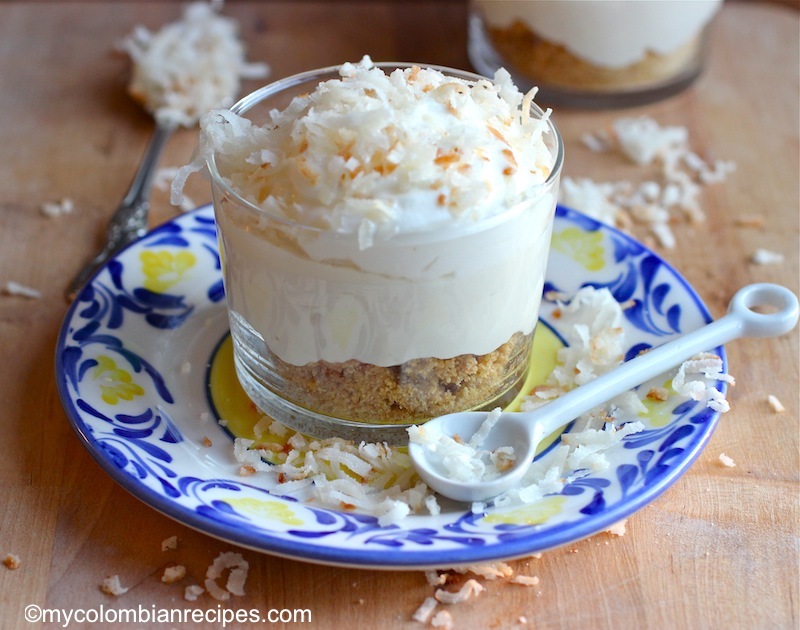 When I thought about the flavors I really love, coconut immediately came to mind, so I decided to make an easy, no-bake cheesecake with coconut flavor. And to my relief, it worked! Sometimes the best desserts are the simplest. Just a few ingredients, no fancy techniques, just really simple, with great flavor. 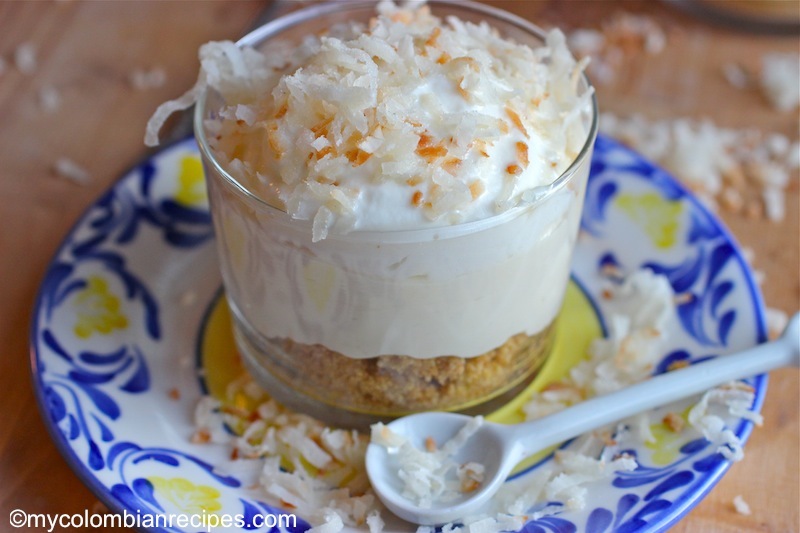 This coconut cheesecake was incredibly easy to put together and came out smooth and creamy, just perfect! 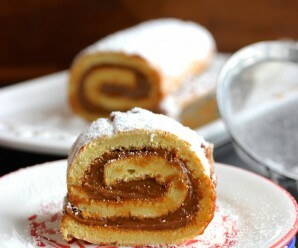 If you have a Thanksgiving or Christmas party coming up, definitely make this dessert. 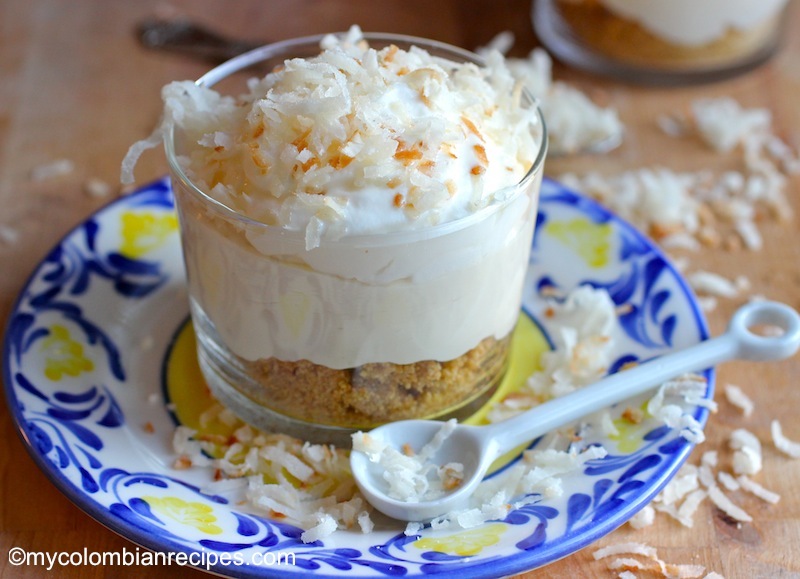 I’m definitely going to be experimenting more with this no-bake cheesecake recipe because make-ahead desserts are a lifesaver when you’re feeding a group. In a small bowl, combine cracker crumbs, cinnamon and butter, mix until combined. Press crumbs onto the bottoms of individual serving glasses, about 2 tablespoons per glass. 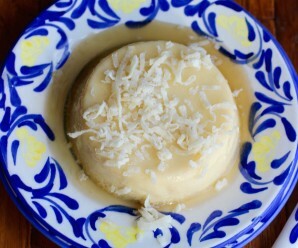 In a large bowl, with an electric mixer, beat the cream cheese, condensed milk and coconut milk until smooth. Add coconut extract and mix to combine. 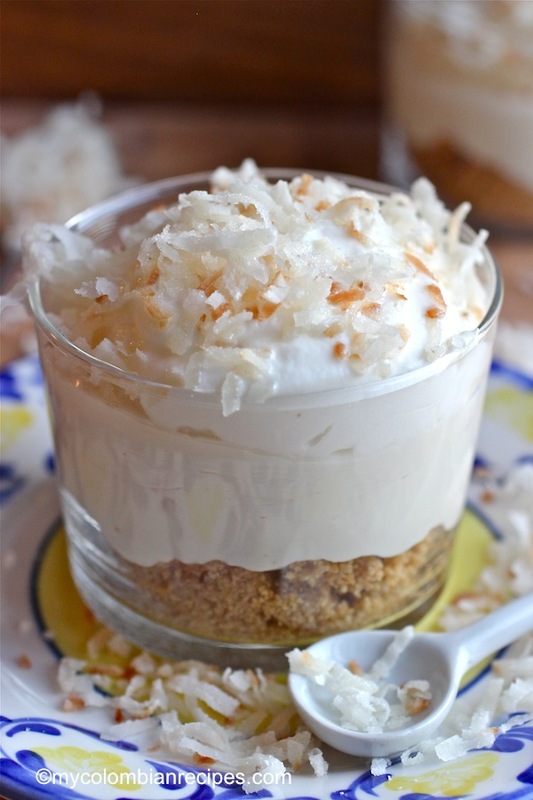 Spoon cheesecake filling into serving glasses, directly onto the prepared crust layers. Cover cheesecakes and refrigerate for at least 2 hours. 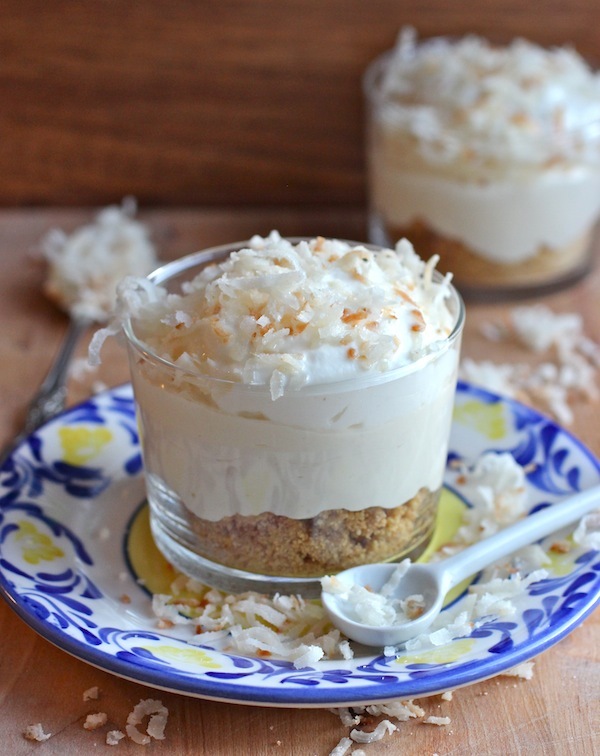 Before serving, top with whipped cream and grated coconut. Hi Erika. How much whipped cream you need to fold with the cream mix?? An easy peasy dessert recipe, Erica. And it looks fantastic too. Quick question because I’m still unsure, in step #2 you wrote “Using a rubber spatula, fold in the whipped topping until well blended.” Was that a typo? I assumed you were folding in whipped topping into the cream cheese mixture. I just don’t want to mess it up. Thanks again! It was a typo… sorry about that! I fixed it! This was the first cheese cake I had ever attempted and if was FANTASTIC!!!! Great Recipe. I used Organic Cream Cheese. This cheesecake sounds great! I was wondering how firm the cheesecake mixture is after it chills? If I were to do a tray of this and cut pieces off instead, would this hold up?